The Boko Haram launched an attack on a Nigerian Air Force helicopter on Wednesday injuring an airman, an official has said. Ayodele Famuyiwa, a Group Captain and Air Force Director of Public Relations and Information, confirmed the attack in a statement to Prenium Times. “The Mi-17 helicopter was shot at severally by the insurgents however there was no casualty except for an airman that sustained bullet wound,” he said. Mr. Famuyiwa said the helicopter was “conveying personnel on medical outreach programme at Gwoza” when it was attacked by the insurgents. 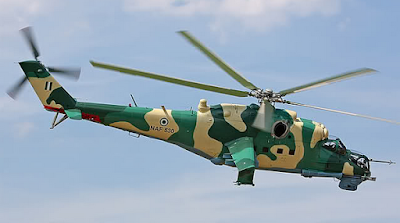 “The helicopter had departed from Maiduguri enroute the venue of the 2-day medical outreach programme in Gwoza when it came under attack by the insurgents. The military’s counter-attack led to the death of scores of Boko Haram members, the spokesperson said. Mr. Famuyiwa said the outreach in Gwoza was part of the Air Force’s medical outreach in the north-east as part of its humanitarian support to Internally Displaced Persons. Isolated attacks by Boko Haram on soldiers and civilians have continued despite the insurgents losing a large chunk of the territory they once controlled to the Nigerian military.